← 4th of July Weekend! Yesterday morning, my backyard was transformed into an outdoor gym with 6 HIIT stations. We had country music, coffee and water bottles…all before 5am! So on to the HIIT sesh! At 4:55am, my parents and I headed into the backyard with some country music and coffee. I wrote out six exercises. Downloaded a HIIT Timer app. Set it to beep after 35-second intervals and 25-second rest periods. We did a light 5 minute warm up jogging across the yard and jump roping. My favorite station was jumprope and least favorite was mountain climbers. My mom and I modified the “push-ups with a clap” on our knees. 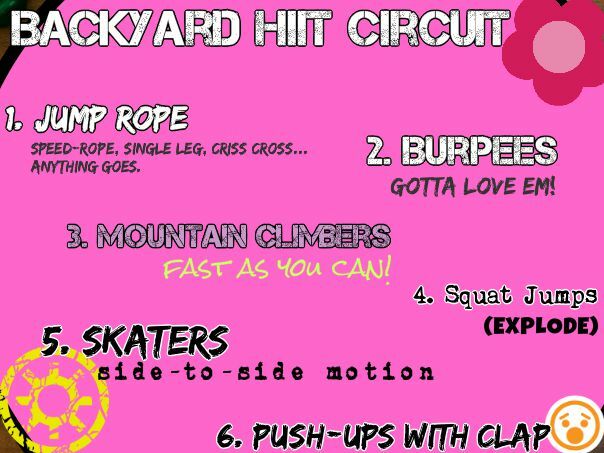 We’ll repeat this circuit every Wednesday for 4 weeks before mixing it up. Are you pumped yet? GO HIIT IT! Posted on July 9, 2015, in Blogging, College, Fitness, Healthy Habits and tagged backyard hiit workout, healthy college blog for students, healthy college girl, healthy college workout plan, healthy college workout schedule, hiit routine. Bookmark the permalink. 1 Comment.